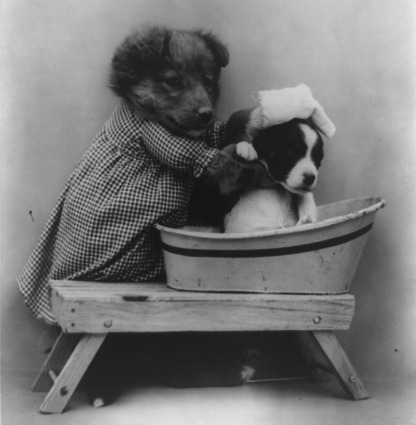 Dog bath time can be fun for both you and your dog! 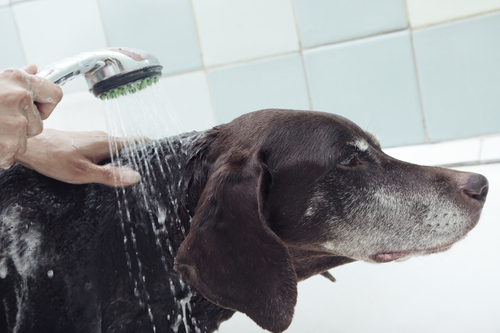 With a little preparation, you can enjoy bathing your dog, instead of dreading the task. So, get everything ready for an awesome afternoon of fun together! Did you know that bathing your dog too little or too often can be harmful? While dogs don’t need to be bathed nearly as often as you do, most dogs do require a bath every 2 weeks. When your Weimaraner gets dirty, it’s time for a bath! 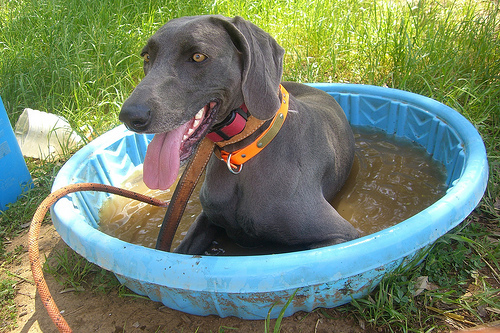 But…if your dog gets dirty or smelly, as Weimaraners tend to do—it’s time for a wash! 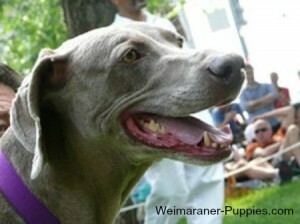 Hunting dogs like Weimaraners often come home dirty and full of burrs after a hunting expedition or a romp in the woods. So if your dog becomes muddy or dirty or just smells a little “doggy!”, then it’s probably dog bath time at your house! My dog Skipper is a dog who loves the outdoors. She just loves to run outside, and go into the woods that are beside our house. After it has rained and she goes for a run, Skipper sometimes looks like a big mud ball when she comes inside. It’s the perfect time for a dog bath! Skipper also loves to find awful, smelly animal poop (or worse) when she goes out into the woods. You guessed it–she loves to roll in it! This justifies another dog bath time for her—and quickly! Dog baths can be fun or they can be traumatic! So, the bottom line on time for bathing a dog, is that it is time for a dog bath, when you want your dog to smell and look a bit fresher. Use your own best judgment. In addition to keeping your dog looking clean and smelling fresh, there are other benefits to bathing your dog. When you give dog a bath, you rid her of certain skin parasites. And, in addition, keeping your dog clean will also help to keep both dry skin and oily skin conditions under control. Before you take your dog to the dog bath tub area (or hose, if you will be outdoors), assemble all the things you will need. Believe me, it will be a lot more difficult to get something after you have your dog. If dog bath time is not your dog’s favorite activity, your pet may disappear while you are getting the shampoo! When you have gathered your bath equipment, keep everything that you will need for your dog’s bath, within reach. Also, wear clothing that can get wet. This can be a messy affair! Make Dog Bath Time Fun! The best way to make sure that your pet is OK with his bath is to start giving him baths when he is still little. Introduce the activity as something that is fun. However, make sure that your puppy or dog understands that his dog bath is NOT an option—you are going to finish what you are starting! A hand held shower head can help you direct the water onto your dog. If you prefer, you can give your dog a shower with a hand held shower head (or hose outside), instead of giving her a bath. The hand held shower head allows you to direct the water to where you want it to go. You can turn it on and off easily. If you decide to use a hand held shower, make the water warm before you put your dog in the shower area. You only have two hands and you may need both to control your dog! Using a regular shower for your dog’s bath is not a good idea, as you can get water and soap in her eyes, ears and nose. To your dog, this will feel like water boarding. It is very frightening to a dog to have water in her nose—it feels like she’s drowning! • Fill the dog bathtub with warm water. Make sure it’s not too hot or too cold. • Brush your dog to get rid of any matted areas or tangles. • Put cotton balls in her ears to keep soap and water out of them. The cotton balls should be placed snugly, but not deeply, in your dog’s ears. • Next, remove your dog’s collar. If you think you will need to have a way to control your dog, you may want to keep his collar on him. You will need to make sure that your dog doesn’t get out of her bath! • Pour water on your dog, using the plastic container. Make sure that you keep water from getting in her eyes. • Apply the shampoo and rub it into her fur. If you are using a flea shampoo with a puppy, read the label to make sure that it is safe for a dog her age. • Rinse your dog carefully, making sure to keep the soap and water from her eyes. Rinse your dog’s head before rinsing the rest of her body. Dry it before rinsing the rest of her body–this will help prevent her shaking water all over you. • After you have rinsed her coat, you can apply a conditioner if you would like. Rinse again. • Squeeze excess water from your dog’s coat and then towel dry your dog. Remove the ear plugs and gently dry the insides of her ears. And, if she is not afraid of it, you might use a hair dryer on the low setting to dry her. 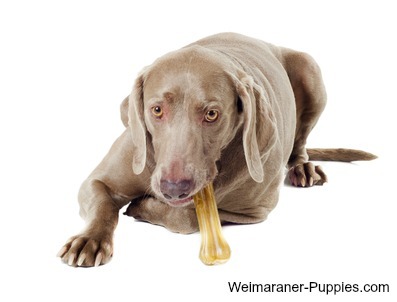 However, your Weimaraner will dry quickly, even without the hair dryer. Last of all (but very important), give your dog a dog treat or two after her bath. Even if her behavior has not been exactly perfect. You want this to be an experience that just keeps getting better all the time—for both of you! Here are some tips for making your dog baths go well. • Keep talking to your dog while you bathe her. Tell her she’s good, reassure her so that she knows that this activity is normal—not scarey! • Don’t forget to reward her with treats. Dogs do remember, and if she knows that a treat is waiting, she will associate her bath with pleasantries. • After the dog bath is over, make sure that everyone tells her how good she was and how pretty she is. You would be amazed to know that dogs like to be “pretty”. • Dogs often run around the room (or outside) with excitement after having a bath. Pepper, our former miniature schnauzer, used to toss her towel up in the air and then chase it. • Dogs will also roll over when they are excited. It would be a good idea to make sure that your dog is in a clean area for awhile so that he doesn’t go rolling in some unpleasant, smelly (or dirty) area! Brush your dog regularly, as this will help to keep him fresh and clean-smelling. 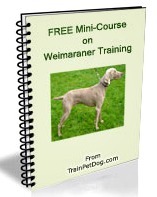 For a Weimaraner, this is a quick five minute job. Brushing removes dead hair, dirt and parasites, and it distributes oil through the hair to keep it nice and shiny. Start brushing your dog when he is still a pup, so he gets used to the activity! What if Your Dog Meets a Skunk? Weimaraners always run the chance of meeting a skunk. With a dog’s curiosity and a Weimaraner’s hunting instinct, it’s not hard to see how a skunk encounter might occur. When this happens, your dog loses—big time! If your dog is sprayed by a skunk, here is what you can do… You guessed it—the first step is dog bath time. By the way, this bath is going to be an outside one! Prepare yourself. Dog bath time after a skunk encounter is not going to be much fun for either of you! • Give your dog a bath, using his normal dog shampoo. Alternatively, you can use 1 quart of 3% hydrogen peroxide, ¼ cup of baking soda and 1 teaspoon of his regular shampoo to wash him. • Rinse him with milk or tomato juice. • Rinse him thoroughly with water. This will probably not make him smell fresh on the first try. You will most likely have to repeat the dog bath time process over several days until your dog smells like a “dog” again! In the meantime, you might want to consider keeping him in a room in the house separate from the main living area.